Both monocot and dicot seeds develop in similar ways and have the same parts. 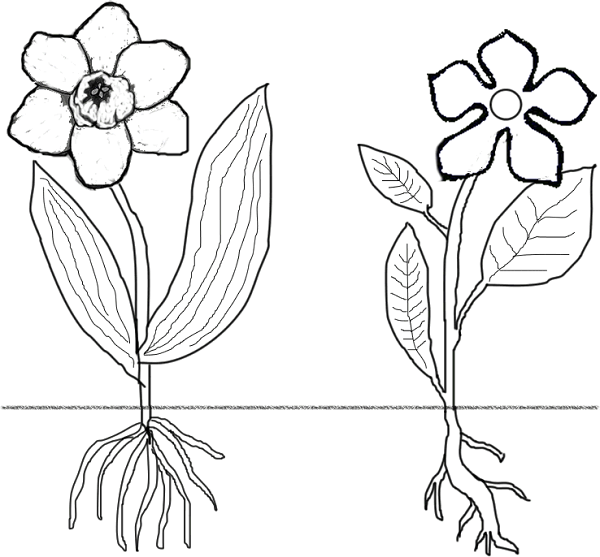 There are a few minor differences: monocots start out with one seed leaf, while dicots have two. The technical word for seed leaf is cotyledon: you can find it on the coloring sheet; it is the first leaf to emerge from a developing seed. Color all the cotyledons (A) on the seeds dark green. As a seed, both monocots and dicots are covered by a seed coat. Color the seed coat (B) yellow. The seed consists of the outside seed coat and a large area called the endosperm which functions as a source of reserve materials and food for the developing embryo. As germination occurs, the endosperm will be broken down and used by the plant. Color the endosperm blue (C). Germination occurs when the seed begins to sprout, usually in the spring and under appropriate conditions the radicle, the part of the seed that will become the root, begins to elongate and grow downward. Color the root brown (D). Meanwhile, the coleoptile begins to grow upward. The coleoptile is a sheath that encloses the shoot of the embryo. The primary function of the coleoptile is to provide protection to the developing shoot as it is passing through the soil. Color the coleoptile orange (E). Extending out from the coleoptile is the shoot. Color the shoot purple (F). Angiosperms are divided into two classes, the monocots and the dicots. The majority of flowering plants are dicots. Dicots include maples, oaks, and magnolias. Monocots are grasses, wheat, corn, and rice. Most of our food supply comes from monocots. The diagram compares the differences between the two. First of all look at the roots. The root of a monocot is called a fibrous root and the root of a dicot is a taproot. Notice how taproots have one main part - called the primary root. In a taproot the primary root grows very large and small roots spread out from it. Fibrous roots, on the other hand, do not have very large primary roots, and many small roots develop and remain near the surface. Color the taproot dark brown and the fibrous root light brown. ). Dicot flowers usually have 4 to 5 petals. Color the monocot flower purple, and the dicot flower pink (make sure all petals are colored). Stems hold the flowers up and attach the leaves, color the stems blue. Monocot and dicots also differ in the way their vascular systems are arranged. In monocots, the vascular bundles are scattered throughout the stem. In dicots, the vascular bundles are arranged in a ring. Color the vascular bundles in both types of plants purple (V), color the stems blue. 7. Fill out the table below. 8. An unknown plant is brought to you and your job is to determine whether it is a monocot or a dicot. You observe that the plant has 6 petals and its leaves have parallel veins. Is it a monocot or a dicot?